When a six-pound box filled with Belgian endive from California Endive arrived on my doorstep — a thoughtful, unexpected thank you for a recent Brit + Co. post I wrote — my first thought was, “that’s a whole lot of endive.” Not to worry, though, there are countless ways to use it! I’ve created a couple all new, totally delicious recipes for showcasing this versatile veggie. Each takes well to a DIY bar-style setup if you’re hosting a shindig, saving you some time and effort all while getting your guests involved in the fun! 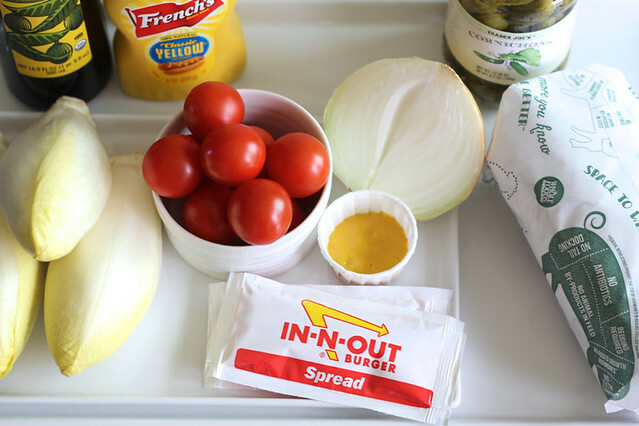 First up: Animal- and Protein-style Burger Bites inspired by my go-to order at In-N-Out. 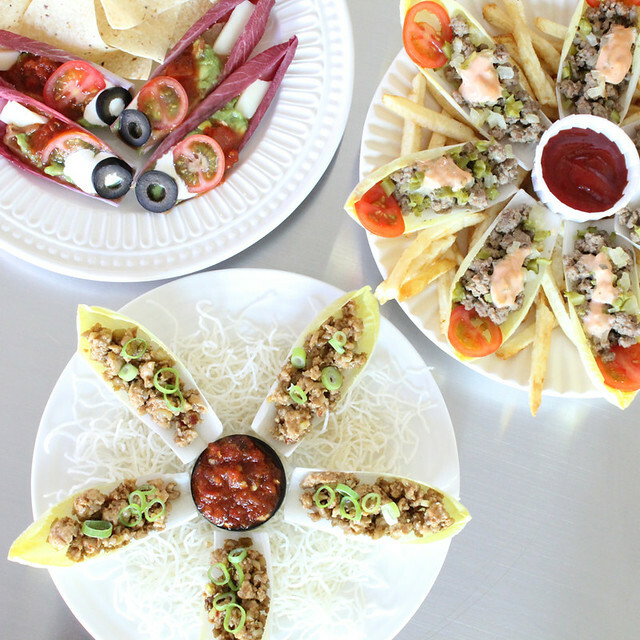 What other creative uses for endive have you come up with? Let’s talk in the comments or on Facebook or Twitter! In a large skillet over medium heat, warm 1 tablespoon of the oil until shimmering. Add onion and cook, stirring occasionally, until translucent and lightly browned in spots (about 10 minutes). Remove onion to a heatproof dish and set aside. Add remaining tablespoon oil to the pan and warm. Crumble in ground beef and cook, chopping into finer pieces, until cooked through. Stir in yellow mustard and black pepper. 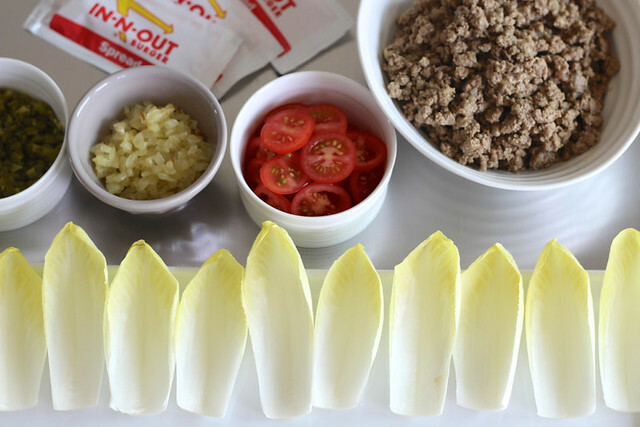 Top each endive leaf with a spoonful of beef and a sprinkle of both grilled onion and chopped gherkin. Arrange a single tomato slice and dollop of sauce on top. 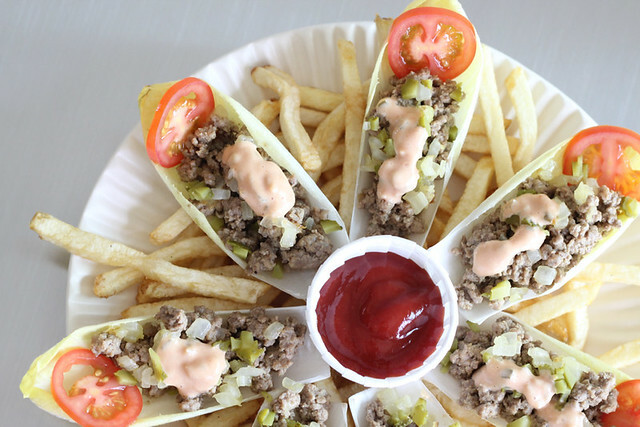 Serve immediately with fries and ketchup on the side, if desired! Avocado Toast Goes Gluten-free, Naturally!